​The would-be landmark $45.2 billion merger between telecommunication giants Comcast Corp. and Time Warner Cable Inc. has fallen apart, according to reports. Comcast may decide to drop the deal late Thursday, Bloomberg Businessfirst reportedduring the afternoon, and could officially announce the death of the deal by the end of the week. In February, Comcast and Time Warner said that their boards had approved a merger between the two, valued at approximately $45.2 billion. Completion of the deal was expected to marry Time Warner’s 11 million television and broadband subscribers with the more than 20 million already under contract with Comcast, the number one provider of those services in the United States. The merger would have also give the joint venture control over around 40 percent of the broadband internet service in the US, raising concerns about a potential telecom monopoly. Comcast squashed those concerns by saying the deal would yield "significant consumer benefits" without "any reduction of competition." 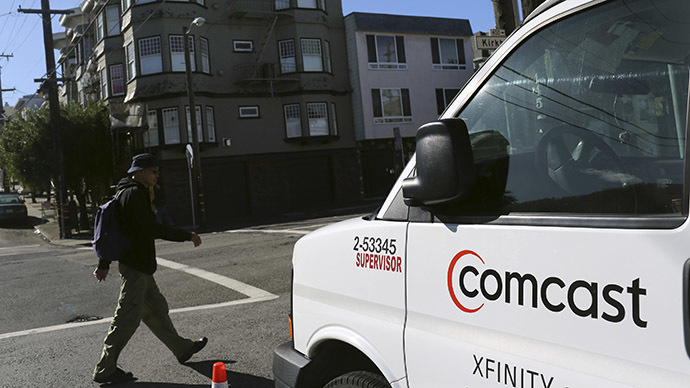 This week, however, sources close to the arrangement told Bloomberg that Comcast was planning on pulling out of the deal amid reports that federal regulators would oppose the merger. Comcast told the Wall Street Journal on Wednesday that it had met with officials with the Federal Communications Commission and Department of Justice recently, but said “we do not believe it is appropriate to share the content of those meetings publicly.” In 2011, the paper acknowledged, a planned $39 billion merger between telecoms AT&T and T-Mobile was aborted amid concerns from the Justice Dept. and the FCC. Matt Wood, a policy director for the anti-merger group Free Press, said in a statement that “internet users can breathe a sigh of relief” if details about the deal’s defeat are true. "That's a very high hurdle to clear in its own right, and a huge barrier to overcome for a disastrous deal like this one, which has no real public interest benefits to show," he said.